Extra Large P.V.A. bags by CatMaster Tackle are ideal for presentnig baits by hand whether dropping over the side of a boat or dropping into the margins. 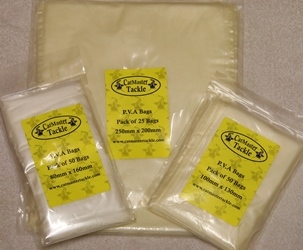 These P.V.A bags combine strength with a medium melt time. Ideal for use in France, Spain & Italy where you need to get a reasonable amount of bait by your hookbait. These PVA Capsules are made with 50% different salts which also adds to the melt time. 20 Metres of continuous P.V.A mesh tubing. Ideal for pellets, boilies as well as pieces of fish. With a medium melt time. 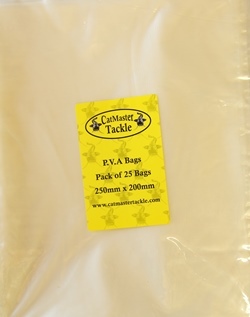 CatMaster Tackle P.V.A melts with no reduction giving the best possible presentation and without a residue.